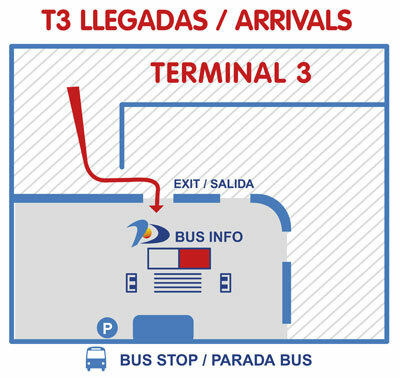 From Malaga airport arrivals terminal you have the choice to take a bus to some destinations. The most common line is the urban line A Express Airport with stop at Terminal T3 and end stop at Malaga city centre but there are other options detailed below. Please notice the bus from the picture is not the one you have to take as line 110 does not reach the airport. This line links the airport with Malaga city centre for 3€ and the journey takes approximately 15 minutes. Itinerary: This route includes a stop at bus station in Malaga, Maria Zambrano train station, Avda. Andalucia and the last stop is at the end of Paseo del Parque. Bus frequency is every 20 or 25 minutes 24 hours a day. This bus stops in front of Malaga airport, after crossing the bridge next to the BP petrol station and at the Cargo Terminal. Itinerary: Bus station, Malaga Airport, Cargo Terminal, Zapata, Peñón, Alhaurín de la Torre Industrial Estate, Penitentiary Centre, Sol Andalusí, Torrealquería, El Romeral, Santa Amalia. Journey time: 58 minutes to complete the entire journey. * This bus line is not adapted for people with reduced mobility. Bus from Portillo Avanzabus with route from the airport to Torremolinos and Benalmadena. This bus has stops at many resorts and districts like Melia hotel, Pez Espada, Carihuela, Holiday World or Torrequebrada among others. * It is possible that the route will be resumed during the summer season. Portillo bus from Avanza Group linking Malaga airport with Marbella without stops. It is a direct bus and the trip takes approximately 45 minutes. 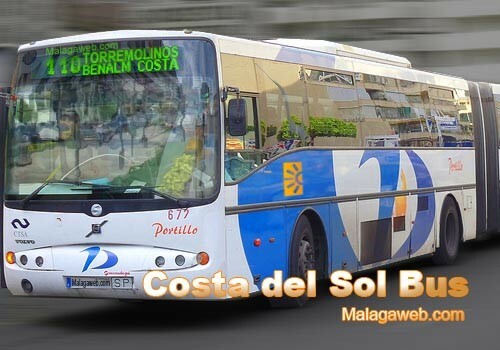 Buses use to be full during the summer season, another option is to take the direct or indirect bus from Malaga city centre. Portillo bus from Avanza Group linking Malaga airport with Estepona, there is a winter and summer schedule. Portillo Bus from Avanza Group linking Malaga airport with Algeciras (next to Gibraltar). There is a winter and summer schedule, so you should take this into consideration when taking this bus in winter as in summer the schedule is extended. Bus from Alsa Group linking Malaga airport with Granada. The schedule is extended during the summer season. Journey time: 2 hours and 30 minutes. *Supra Economy service has WIFI and multimedia entertainment. Both rates allow you to bring a pet, a bicycle or a surfboard. Departures at 10:45, 11:30 am, 1:30, 4:00, 7:30, 8:45 pm. Bus with stops: Málaga, Loja, Venta del Pulgar, Huetor, Moraleda, Fuensanta, Peñuelas, Lachar, Cijuela, Santa Fe, Granada. Departures at 11:00 am, 5:00 pm. Bus with stops: Málaga, Villanueva del Rosario, Villanueva del Trabuco, Salinas, Cuesta de la Palma, Riofrio, Loja, Venta del Pulgar, Huetor, Moraleda, Fuensanta, Peñuelas, Lachar, Cijuela, Santa Fe, Granada. Buses from Alsa Group linking Malaga airport to Almuñecar. The schedule can change depending if winter or summer season. Departure from the airport at 2:15 p.m. Arrival in Almuñecar at 4 pm. 14:15 - Direct bus Supra Economy*. For more detailed information about this bus you can read our blog post here. Buses from Alsa Group from Malaga airport to Seville, the schedule can be changed depending on the season. Journey time: 3 hours and 15 minutes. Departures from: 4:45 pm and 7:30 pm. Another option is to take a train or the bus to Maria Zambrano train station where you can take a train from Malaga to Seville. More info on getting to Seville from Malaga. Buses of the Alsa group from the airport to Almería, the timetable may change depending on whether it is low or high season. Itinerary: According to semi-direct or direct timetable from the airport. Journey time: 3 hours and 30 minutes. *Another option is to take the train from the airport to Maria Zambrano and take a bus to Almeria. Where to take a bus from the airport? Bus stop is just at the arrivals T3 Terminal. You can also take a train or a bus linking to Malaga bus terminal or Maria Zambrano train station from where you will have many more choices and extended schedule for getting to your desired destination. If you prefer a private transport you can also book a taxi from the airport or hire a car, check our links to know what is the best and most economical option.